A Hospitalist is a physician who specializes in caring for patients in the hospital. The Erlanger Hospitalist Group includes board-certified internal medicine or family practice physicians who have additional training or experience in the field of hospital medicine. This means they don’t see outpatients or care for patients after discharge; their complete focus is your inpatient stay at the hospital. How often will I see my Hospitalist? Your Hospitalist will see you daily to direct your treatment and will always be close by. In fact, our Hospitalists are available 24/7 to meet the needs of patients. 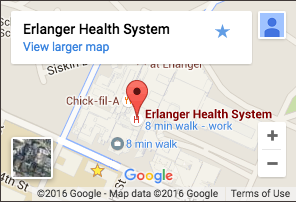 Who is on Erlanger’s Hospitalist Team? In addition to 36 physicians, Erlanger’s Hospitalist Team includes 14 Nurse Practitioners (NPs) as well as Care Navigators and Patient Advocate Liaisons (PALs). The team works closely together to ensure that you are provided with the highest quality of care. Hospitalists and NPs are even available around-the-clock to provide care to patients in the hospital. Consultations from other physicians are sometimes necessary and the Hospitalist providing you care will arrange for this. How does my Primary Care Physician know when I am admitted or discharged from the hospital and what was provided during my hospital stay? Each day, the Hospitalist LPN (Care Navigator) notifies, by fax, the patient’s Primary Care Physician (PCP) that an admission to the hospital has taken place. This notification includes information on how your PCP can contact your Hospitalist during your hospital stay. PCPs are also notified daily, by fax, when a patient has been discharged from the Hospitalist Program. Along with the discharge notification, the Hospitalist LPN (Care Navigator) will fax the Hospitalist’s dictated outline of your hospital stay. When will my doctor see me for a follow-up? You will need to see your Primary Care Physician (PCP) soon after your discharge from Erlanger. Hospital staff will help you arrange this follow-up appointment. Since our staff has communicated with your PCP, he or she will be aware of your hospital stay and can request additional medical records if needed.